As Formula One dips its toes into summer break, it’s time to take a breather from championship battles and silly season rumors and think about the things that really matter. Like how freakin’ cool the air flow paint looks during F1 tests. After the Hungarian Grand Prix, the F1 teams stuck around in Budapest for a mid-season test to gather some data before they dive in for the last stretch of races. They got some junior drivers behind the wheel to test out their skills and had the veterans keep an eye on the problem areas. And my goodness are the results of the air flow freaking incredible. If you didn’t know, teams will throw some air flow visualization paint on their cars to make sure that the air is actually doing what they want it to do. Sure, they have tons of fancy wind tunnels to help them out, but sometimes things are different in practice than they are in theory. Oh, Williams. With two young drivers at the helm, the team seems like they have no clue what they’re doing, and their fully flow-viz painted car showed exactly how little they know. I’m sure it’s sad for all the poor Williams fans out there, but, my God, the paint. Formula One liveries are pretty boring. We’re lucky we actually have some colors on the grid this year, but, even with pink and orange and yellow cars, it’s still just pretty standard looking. I want more cars with neon schemes. Give me the Penske Menard’s highlighter-yellow. Give me neon pinks and pastel blues. Hell, let’s break the stereotype that green is unlucky and get some in-your-face mint going on. These paint-splattered cars look cool as hell. 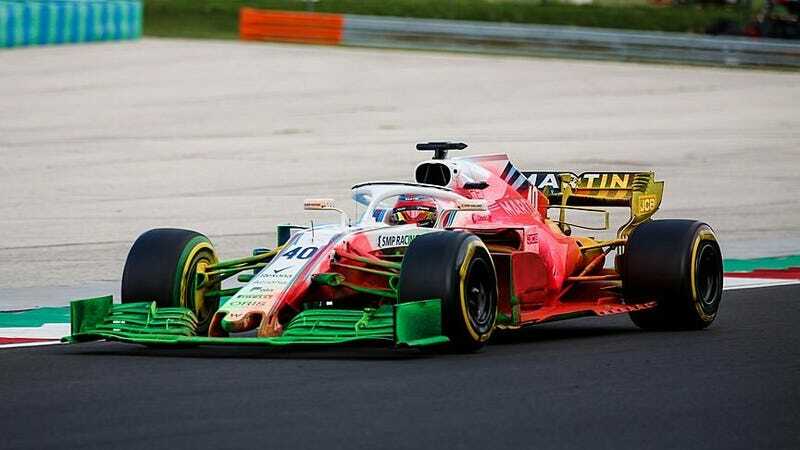 I mean, I’m sure a brighter car would make using the flow-viz paint more difficult, but I can’t be the only one who thinks F1 needs some rad 80s technicolor party liveries.